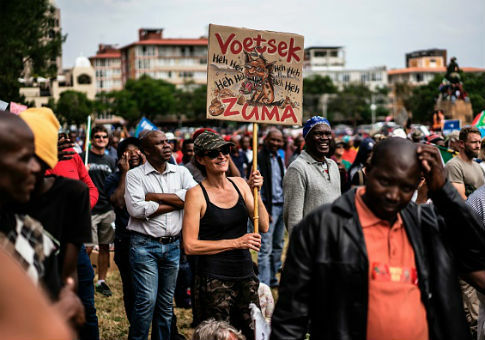 A blog post published Thursday on the Huffington Post's South African version of the site advocated stripping white men of their right to vote. Shelley Garland is an activist and feminist completing a Master of Arts degree in philosophy and "working on ways to smash the patriarchy." "Could It Be Time to Deny White Men the Franchise?" she asked Thursday in the title of her blog post. "It is time to wrestle control of the world back from white males, and the first step will be a temporary restriction of the franchise to them," according to Garland. "If white men no longer had the vote, the progressive cause would be strengthened," she explained. "It would not be necessary to deny white men indefinitely–the denial of the vote to white men for 20 years (just less than a generation) would go some way to seeing a decline in the influence of reactionary and neo-liberal ideology in the world." Garland blames white men for electing Donald Trump and voting for the United Kingdom to leave the European Union. "The influence of reckless white males were one of the primary reasons that led to the Great Recession which began in 2008," she added. "This would also strike a blow against toxic white masculinity, one that is long needed." Garland also floated the idea of redistributing wealth away from white men and banning them from holding office. "The violence of white male wealth and income inequality will be a thing of the past," she insisted. "Although this may seem unfair and unjust, allowing white males to continue to call the shots politically and economically, following their actions over the past 500 years, is the greater injustice," Garland concluded. This entry was posted in Culture and tagged Huffington Post, Shelley Garland. Bookmark the permalink.